The Coveo IBM Notes connector fully supports the IBM Notes security model. When you want users searching for IBM Notes content in a Coveo search interface to only see the content to which they have access in IBM Notes, the connector needs a security provider to be able to index the permissions for each indexed IBM Notes item. 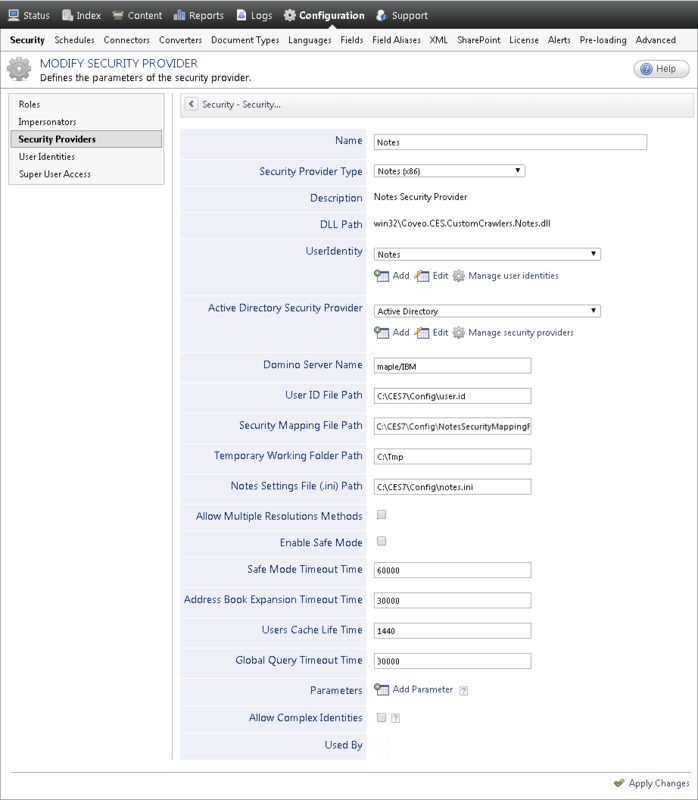 Choose a meaningful name to identify the security provider. In the drop-down list, select Notes (x86). In the drop-down list, select the user identity that you selected or created previously (see IBM Notes Connector Deployment Overview). In the drop-down list, select Active Directory or the active directory security provider type that you created to allow this security provider to resolve and expand the groups (see IBM Notes Connector Deployment Overview). Enter the name of the Domino server that holds the IBM (Lotus) Notes address book (Domino Directory/names.nsf). You must leave the Domino Server Name box empty when the Personal address book is used. One of the possible name form is the Notes hierarchical format ([Department]/[Company name]. Note: The Domino server name is located above the Inbox folder to the left of your Mail Inbox view. Enter the full path to the user.id file that you copied from the IBM Notes server to be used to be used by the connector to authenticate to the Domino server (see IBM Notes Connector Deployment Overview). If left empty, this parameter is assigned the complete path of the current or last user.id used in the IBM Notes client. Enter the full path to the security mapping file you created (see IBM Notes Connector Deployment Overview). The mapping of IBM Notes users to their corresponding Windows users is achieved by the security provider using this file. When you are unable to create a security mapping file, contact Coveo Support for assistance. Enter the full path to the folder on the Coveo server where temporary files are stored by the security provider. This folder must be unique for each security provider. Enter the full path to the notes.ini file that you copied from the IBM Notes server to be used by the connector to initialize the Notes API (see IBM Notes Connector Deployment Overview). This file contains configuration information and user preferences. This is the notes.ini created by the IBM Notes Client installation (local notes.ini). If left empty, this parameter is assigned the path of the current IBM Notes installation. Whether the security mapping file contains multiple resolution methods. When enabled, this parameter make sure every Windows username being formed is validated against the Active Directory. Whether the crawling safe-mode is enabled, to avoid conflicts when crawling corrupted Notes databases. Important: When this parameter is used, you must also add the parameter to the corresponding security provider. Otherwise, the crawling in safe-mode is going to be in a deadlock state when two competing actions are each waiting for the other to finish, and thus neither ever does. Furthermore, crawling in safe-mode is significantly slower comparing to the normal crawling process. When the Enable Safe Mode option is selected, this parameter is used to define the timeout time (in milliseconds) on the global mutex that protects the Notes API by blocking the connection to one at a time. The default value is 60000 ms. Important: Do not change the value of this parameter unless instructed by Coveo Support. The timeout value (in milliseconds) allowed for the initial expansion of the Domino address book. The default value is 30000 ms. Note: This process normally takes less than 30 seconds, but with very large address books, the expansion can take as long as several minutes. Adjust this value according to your needs. Once the entire list is built, the connector goes through all users to retrieve the required fields. The refresh interval (in minutes) of the users cache (local copy of the Domino address book). The default value is 1440 min (24 h). Example: When you are performing permission tests, you can temporary reduce this value to a short period such as five minutes to ensure that your permissions changes and notes are quickly made available to the connector. Do not forget to return the parameter to its default value when you are done to prevent overloading the notes server. Note: When your Domino address book is modified frequently (users are added or deleted), decrease the Users Cache Life Time parameter value here and in your Notes sources with the UsersCacheLifeSpan hidden parameter, so the users cache is updated regularly with the latest user additions/deletions in the Domino address book by synchronization (see Modifying Hidden IBM Notes Source Parameters). The timeout value (in milliseconds) allowed for a query to be executed against the Global address book database before sending an error message. The default value is 30000 ms. Note: This process normally takes less than 30 seconds, but with very large systems, the process can take as long as several minutes. Adjust this value according to your needs. Click Add Parameter when you want to show and change the value of advanced source parameters (see Modifying Hidden IBM Notes Source Parameters). Create and index a source (see Configuring and Indexing an IBM Notes Source).